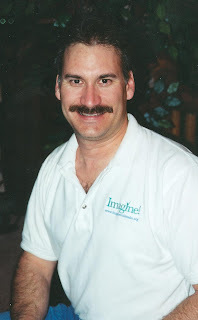 Today marks the 14th work anniversary of Kevin Harding, Imagine!’s Director of Information Technology. What better time to share some historical perspective about Imagine!’s technology use, as written by Kevin back in 2013 as part of Imagine!’s “50 Years, 50 Stories” series? Of course, even some of what Kevin says below has changed over the past three years as we at Imagine! continue to keep on top of the latest in technology and explore how it can make us more effective and efficient with our service delivery. The Evolution of Technology at Imagine! Technology, and Imagine!’s use of technology, have come a long way in the last 50 years. The first real personal computers to be commercially available, the Apple II and TRS-80, were introduced in 1977. Back then Imagine!’s case managers would hand-write individualized plans. If anything needed to be typed, they would use a dictation machine recording to a cassette tape, and an administrative assistant would do the transcribing on a typewriter. At least the typewriters were electric. The first computers to come to Imagine! arrived around 1979 and were used in the business office for accounting. There was no network or central file server. In the early eighties, the administrative assistants began to get computers to replace their typewriters. There were no fancy laser printers, but instead dot matrix printers attached to individual computers were the norm. The Microsoft Windows operating system we’re so familiar with now wouldn’t be available until 1982 and not widely adopted until version 3.0 was released in 1990. Imagine!’s first computers were running DOS, Microsoft’s disk operating system, and using WordPerfect for word processing. On one occasion in the early 80s, when a document needed to be typed up and four copies sent out, the administrative assistant’s computer started to malfunction. A certain Executive Director who shall remain nameless thought he could fix it. He instead broke it to the point that the four copies were completed by hand to make the deadline. Our Internet is 156 times faster, and Imagine! could store one half of the written content of the Library of Congress on its servers. If you own a smart phone that was purchased in the last two years, you have more computing power than the file server and more storage than all the computers that held all of Imagine!’s electronic information 20 years ago. I'll be happy to give Kevin a hand.